Leggat was recruited from Edinburgh University's Forestry School before the war, but he did not take up his appointment until 1946 after he was demobbed. Staff were urgently needed in the colonies, and he was thrown into his chosen career at the deep end, displaying his Scottish qualities of enterprise, energy, efficiency and tenacity. He managed his duties well, was devoted to his task, and commanded the respect of his African staff and expat departmental colleagues. He served in the Uganda Forestry Department during a formative period of rapid development concerned with a great raft of issues: survey, demarcation, stock-taking, gazetting, plantation, scientific research, management, production, harvesting, regeneration, administration, and finally localisation. The job required safari travel which he shared with his wife Christina. He loved the country, and its sporting opportunities. Our astute Colonial Office selectors were as almost ever right in their choice. In my recollection Uganda forestry never had a high profile. It was over-looked by the 1953 East Africa Royal Commission on Land and Population. In 1948 we Oxford Colonial Administrators were informed by Worthington's 1938 Science in Africa and were examined on forestry questions about land use for forestry plantations and exploitation of reserves. Leggat writes in Chapter 13 about the Budongo mahogany forest, my first confrontation with real forestry where many policy issues arose. He also betrays his passion for fishing for Nile perch in nearby Lake Albert. This is a nostalgic read: a memoir about the simple social life, with too little about his industrious departmental routine fieldwork, and almost nothing about the Department's over-arching policy framework. It reflects the life of the post-war colonial expat, not racist, but racially organised. Some of his stories embarrass, e.g. his decision not to hire a sleeping dictionary because this would have damaged his career prospects, and a rather dry account which makes it sound like a marriage of convenience rather than a love-match, which clearly it was. There are errors and omissions, but I leave the reader to discover these. Like many of his colleagues he left at Independence in 1962, aged 45, to do forestry in New Zealand. Three years before there were 23 expat conservators and 15 African foresters in the Department with George as No 3. Three years after his departure a local, not in the 1959 staff list, took over as Chief Conservator. But solid foundations had been laid, and the Department survived rapid changes and Amin's civil war, and forestry still thrives "with the current emphasis on natural forest in reserves and parks, aimed at bio-diversity at the expense of timber production ... but which could carry the seeds of its own destruction ... without alternative supplies of timber from fast growing plantations" (Osmaston, see below). Surely a living memorial to Leggat and his colleagues? 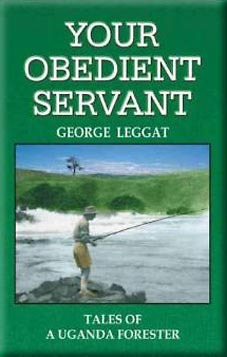 The style of Leggat's memoirs reminded me of a very readable booklet by Dr Wiggins on his Early Days in BEA and Uganda. He walked up from the coast in 1899, and 27 years later sat in Exco as DMS, had a contretemps with HE, became a missionary, founded the Kumi leper settlement, took Holy Orders, was appointed to an Oxfordshire living by Lord Macclesfield, married us in 1948, and at Independence told me that he had drawn more from his Uganda pension than in pay. Could this be a subject for OSPA research? Having read this book, your appetite will have been whetted for more. I therefore commend for further reading two excellent papers delivered at OSPA's 2004 How Green Was Our Empire seminar by Henry Osmaston and John Mackenzie. The former has a useful reading list.